The measurement of roundness is often debated. Many of these debates are centered around the tip radius and filtering used in the measurement. This debate is further complicated by the fact that the typical roundness graph distorts reality. When we look at a roundness graph for an outside diameter measurement we see locally concave areas. Often these areas look rather sharp. This is due to the polar plot scaling and the magnification of “errors” rather than the magnification of the “size” . The rightmost plot appears as though there are large concave areas on this component. However, this data is from a precision gage ball. The actual workpiece has no concave areas as the polar plot seems to indicate. 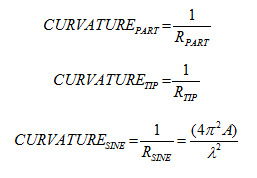 In fact the actual surface is completely convex and, given the magnitude of the roundness errors, a flat follower would have no problem measuring the roundness of this surface. On the right most graph (above) we get the perception that the valley bottom becomes a sharp point. However, this is not the case with the actual data. RSINE the smallest radius of the sine wave (for example at the valley). See Figure A4. What about Inside and Outside Diameters? But what about the filter? The above defined tip radius will actually touch the bottom of the sine wave, however it will only occur at a discrete point and will cause a “cusp” or “sharp corner”. Since the cusp is very sharp, it will be filtered and some of the depth will be lost. Thus, a smaller tip should be used in order to gain additional confidence. A reduction of 25% may be adequate as a safety margin. Roundness may continue to be debated. But this discussion shows that the relationship between surface waveforms and the tip radius can be understood. For more help understanding your toughest metrology challenges (and help with settling your debates) contact Digital Metrology today!